The problem with both approaches is that they are applied to getting new customers or acquisition. It’s all about getting new people in the door and on the site, with very little thought given to the existing customers. One clear sign of this is a store having a generic customer retention plan or no retention plan at all. All customers end up getting treated the same, whether it’s their first order or their 50th. Sometimes customers are lumped in with non-customers, which is an even worse disservice to them. It’s no surprise then that customer disloyalty is common in eCommerce. I mean, can you blame the customers? Why should a store even care about loyal, repeat customers though? Here’s some hard reasons. Loyal customers — that is, customers who come back for multiple purchases — spend on average 3%-15% more in each of their subsequent orders (according to Adobe). This boosts your Average Order Value and adds a significant amount to that customer’s Lifetime Value (easily doubling or tripling it). CMO also found that conversion rate jumps from the new customer rate of 5-20% up to 60-70% for a repeat customer. Not only are they spending more with each order, but there’s a higher chance of converting those visits into orders as well. This double-whammy of more revenue and a higher conversion rate dramatically lowers the cost to acquire a customer. If you could halve the cost of a new customer, how many more customers would you like? In order to increase your customer retention and start tapping into your repeat customers, there are three metrics you need to watch. The first metric is one you should already know, your Average Order Value (AOV). This is the simple average amount of your orders. It’s most important to track this store-wide and since it’s an easy metric to calculate, you can keep a close eye on it. Additionally, if you can track your AOV for the first and second purchases then you’ll have a lot more insight into what your repeat customers are doing. Ideally you want the AOV to trend upwards as a customer builds a relationship with your company. So an AOV of $100 for the first order should become around $103-115 for the second order and $106-132 for the third. One caveat with this is that if your standard product mix includes a one-time equipment product along with replenishment products. In that case, the first order will be high (equipment purchase) and then drop for the replenishment products. Your Repeat Purchase Rate (RPR) tells you how often your customers make a repeat purchase. 20% means that out of 100 orders, 20 will be repeat purchases. This is a good metric use in order to get a rough idea about how loyal your customers are. A low rate means that your customers are having a bad experience after purchasing and thus leaving. The interesting thing about your Repeat Purchase Rate is that it can have a compounding effect on your revenue. 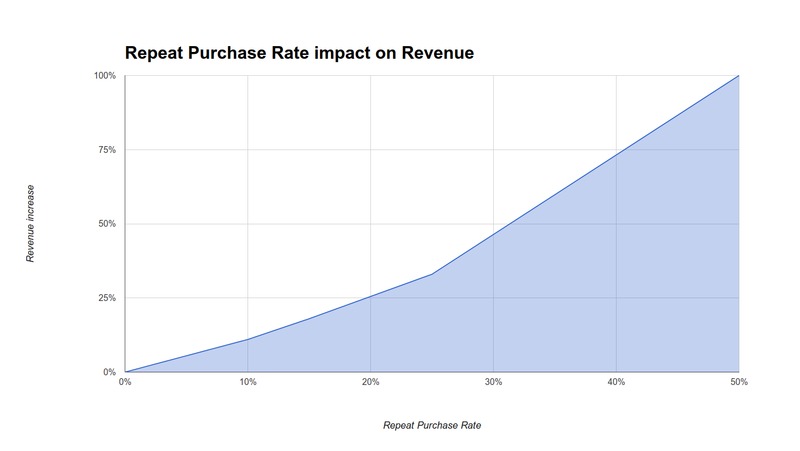 Your Repeat Purchase Rate is definitely a metric where a small increase can have a significant impact on your revenue. Latency or Purchase Latency adds the time aspect to your repeat purchases. A latency of 10 days means that on average, a customer is placing a new order every 10 days. The lower the latency the better, but more critical is having a low latency from the first to the second order. Every one of your customers has placed at least one order so this step has the largest number of customers in it. The sooner you get them to place their second order, the better. Now that you know about the three core metrics to track, how does adding a customer retention campaign affect them? First off, your Average Order Value will change. In some cases it will increase and in others it will decrease. As you’ll see in a minute, it’s the relationship of the AOV to the other two metrics that are important. Adding or improving your retention campaigns should increase your Repeat Purchase Rate. This is where the majority of the benefit of a retention campaign is going to come from. By keeping in contact with customers and keeping them satisfied, there’s a greater chance that they’ll place another order with you. Your Purchase Latency may or may not change. This is where you have to decide how you want your retention campaign to work. Much of this depends on your AOV, profit margins, and how much order volume you can handle. Once you know your metrics, you can "run the numbers" and simulate what would happen if things changed. If in doubt, try to increase the number of orders with a lower latency. This will give you multiple touch points with your customers which will help build trust and loyalty. One final point: use your metrics as a tool to guide your decision making. Don’t collect them just because you can. Collect them because they will help you answer questions you have. If you’re wanting to learn more about how to guide your retention decisions with metrics and data, I have a free course that will give you the knowledge and tools that make that happen (and boost your revenue at the same time). Sign up for it here. Eric Davis helps ecommerce entrepreneurs customize their Shopify stores using public, private, and unlisted apps. He has created a free course to teach Shopify store owners how private apps work, what they can and can't do, and over a dozen examples of how they can increase your revenue. Get that course here.